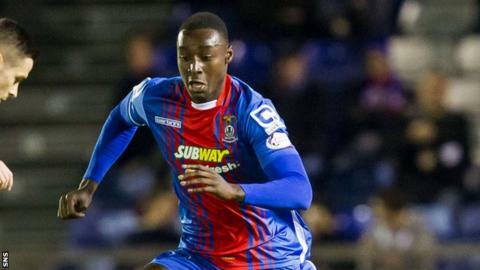 Inverness Caledonian Thistle manager John Hughes says his priority is a new striker in the January transfer window. The Highlanders have scored just 21 goals in 18 league games this season, however have scored four times in their last two games. "We want to keep Miles Storey and we definitely need somebody else up there," said Hughes. "We have a couple of trialists in, but any money going about it has to be spent on the top end." On Saturday Inverness came from behind twice to draw 2-2 with Dundee United, with Liam Polworth and Lewis Horner getting the goals. Ex-Caley favourites John Rankin and Billy McKay were on the score sheet for Dundee United. James Vincent and Danny Williams have filled in attacking roles this season, while Tobi Sho-Silva and Dani Lopez have failed to make the desired impact. "We need that extra fire-power up there," he continued. "We're just lacking a wee bit in the top area right at this moment. "You look with envy at Billy Mckay. Quite a few of those today, he would have scored. "Guys like Ryan Christie would give us that right bit of quality. But we keep working the guys up top. We need to turn them into these kind of players."